Makka Cholam is corn that is grilled on Chennai beaches by vendors who used a special equipment to grill them - with fire sparks flying all over the place (especially when the beach was more windy than usual!). Here is is a minute and a half video showing this. How these vendors grill the corn with no gloves or any protection is still a conundrum to me! After all the fireworks the corn is grilled to perfection, then the next step is to apply a layer of salt, chilli power using a slice of lemon and squeeze the remaining lemon juice on it. Every bite is a crunchy, yummy and delicious! So, with being memorial day weekend and a wonderful sunny day, I decided to grill my Makka Cholam with my own small grill. I decided to get a little innovative and cheap (?) with this particular wine pairing. Makka Cholam is the epitome of a simple, cheap street food when you decide to spend a nice day on a beach in Chennai without too much damage to your wallet. If I can take the same approach with its wine pairing, that would be a made-for-each-other deal, right? And not to forget, a slushy would be nice and chill to pair with the crunchy, spicy corn on a hot sunny day! So, I decided to do just that. And hence was born the idea of a wine slushy. For my wine slushy I used a Moscato d'Asti I had in the fridge - that I was not too fond of sipping as-is. So, this is the added advantage of making wine slushies; you can save the delicious wines you like to sip on and utilize wines that are not your favorite 'sip-ons' to make these. I used this recipe I found online for my wine slushy. I froze them overnight in an ice tray, so they would be ready to be sipped on after I grilled my Makka Cholam. When I was ready enjoy to my corn, I took my slushy ice tray, out of the freezer and put them in blender for a quick blend. I used about 4 cubes for one glass. A quick blend and the slushies were ready to be enjoyed! It was very interesting, how the Moscato tasted so interesting in this semi-solid form. I could still taste the peach, apricots and some honey suckle flavor - but all in a slushy form! 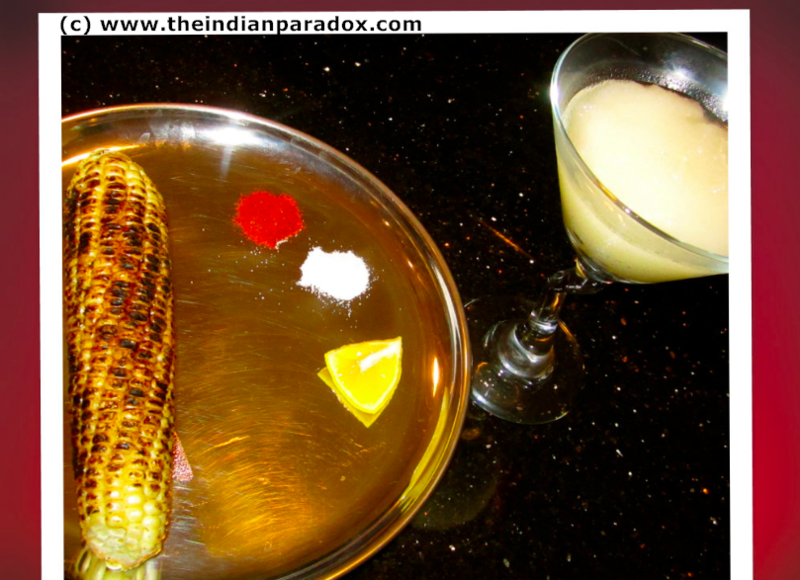 I went out to the patio, finished grilling my corn and applied the salt, chilli powder, lemon juice concoction. Then I took a HUGE bite in to the corn, and made a nice big dent on it. Next, I took a spoonful of my slushy (yes, I needed a spoon - it was too thick for a sip!). Hmmm, the bright sunshine, occasional wind, crunchy bites of spicy corn, finished off with a spoonful of Moscato slushy. Let me just say, life can change from good to absolutely wonderful with moments like these! It was a very memorable Memorial Day indeed! Nothing to complain with a long weekend, lots of sunshine, nostalgic street food in one hand and a wine slushy in another!